Every year, the Columbus Dispatch publishes a holiday cookie section with some new recipes. Knowing that I would be doing my holiday baking, Mom would send me the Dispatch cookie section to give me some new ideas, and to say thanks I would always make sure that a big plate of cookies went her way at the end of the process. Mom always enjoyed a good Christmas cookie! So, as a tribute to Mom, I visited the Dispatch cookie guide webpage for 2017 and tried to pick out a recipe that I thought Mom might like. She had a taste for the simple sugar cookies, and this rosemary cookie recipe (from Margaret M. Titerington of Ostrander) looked intriguing — the sort of straightforward cookie that Mom might have liked and that might have been baked back in old England during the holidays and consumed with a cup of tea with lots of milk. Combine all ingredients, except rosemary, in mixing bowl. Mix thoroughly. You might need to add a little more flour if dough appears sticky — add 1 tablespoon at a time. Add rosemary and gently mix into batter. Chill the dough thoroughly until very firm. Roll dough in small balls and then in sugar and flatten with the bottom of a glass dipped in sugar. Bake, watching carefully until light golden — about 5 to 10 minutes. Baking time depends on how large you form the cookies. They’re rehabbing the Dispatch building in downtown Columbus. The building is fenced off, the windows have been removed, mobile platforms are moving around the structure, and you hear the familiar booms and bangs as workers pull out debris from the interior of the building and hurl it into dumpsters on the ground below. From the amount of work being done, it looks like the building is being effectively gutted. 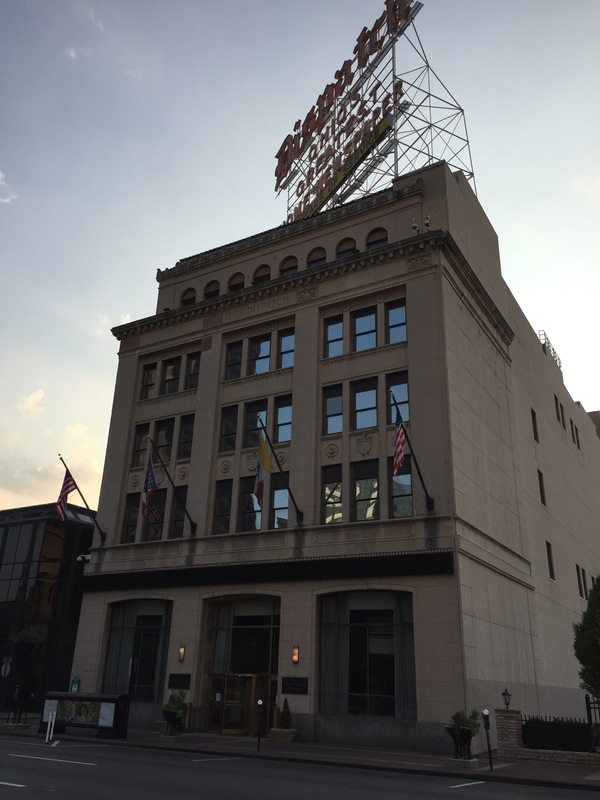 Located in the center of the city, just across Third Street from the Ohio Statehouse, and recently added the Columbus Register of Historic Properties, the Dispatch building is an unremarkable five-story structure — except for the sign on the roof. 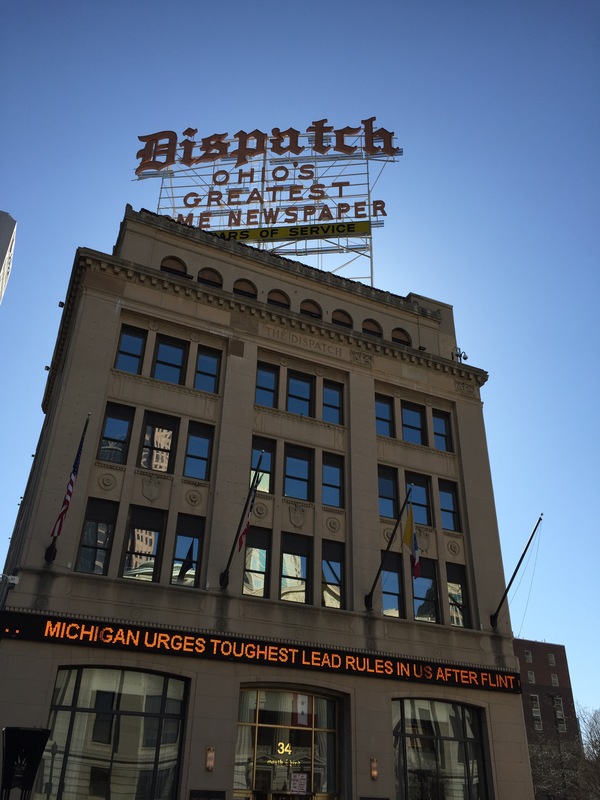 The sign is a huge, elaborate metal and neon structure, half again as tall as the building itself, that has towered above the downtown core and beamed the name of the Dispatch and its claim to be Ohio’s greatest home newspaper for as long as I’ve lived in Columbus. The sign is a true Columbus institution and a throwback to earlier days in a city that has really reinvented itself in recent decades. Of course, things change. The Dispatch editors and reporters have been moved to a new building about a block away, and the old Dispatch building is going to be made available to new tenants once the rehab work is done. 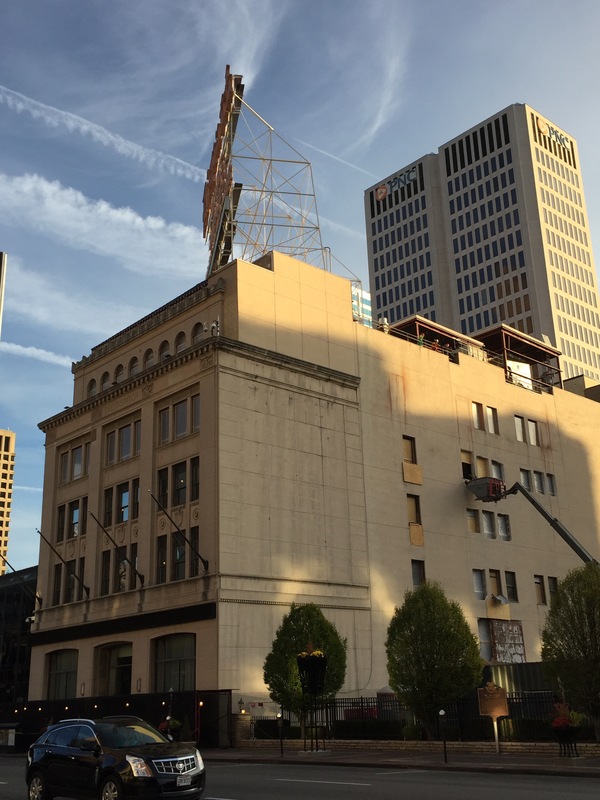 The city’s Downtown Commission has approved the rehab work, but the filings and applications don’t address what’s going to happen to the sign. The Downtown Commission application cryptically notes, with respect to the sign, that “resolution as to what will happen to it has not occurred” — which makes it sound like the sign’s future is iffy. I hope the sign survives. Downtown Columbus just wouldn’t be the same without it. I regret to report to everyone that, for the last few days, there has been no crawl on my walk into work. I’m referring to the news crawl on the front of the Dispatch building, of course. I’ve come to rely on it for my news blurbs in the morning, so I can feel that I’m at least somewhat informed when I arrive at the office. And I’ve come to to look forward to the bullet-point format and phrasing of the crawl, too. ANOTHER SHOOTING ON NEAR EAST SIDE . . . . TRUMP ANTICS MYSTIFY EUROPE . . . . THREE-LEGGED FROG DAZZLES FAIRGOERS . . . . 17 RECIPES FOR SUMMER PORK . . . . FLYING CARS MAY BE JUST AROUND CORNER . . . . The crawl always seems to feature incredibly provocative stuff, presented in the most cryptic style. You’re never really sure what the news is, but it sure sounds interesting. But now the crawl has gone dark, and with it, my morning mood. Come back, crawl! Today the Columbus Dispatch carried a story noting that Columbus ranked number 8 in the country in the number of dog bites of postal workers. There were 43 dog attacks on postal workers in Columbus in 2015 — more than twice the number of dog attacks the prior year. What’s weird is that the Dispatch considered this to be news at all. Literally, it’s a “dog bites man” story, and therefore is the classic definition of non-news. Dog bites happen regularly in our humdrum, everyday lives. Postal workers get bitten by dogs so often they train postal workers to deal with it, and they even keep statistics on it. And when Columbus isn’t even at the top of the dog-bite list, but comes in at number 8 — which is a pretty undistinguished number, too, when you think about it — and trails Cleveland in this dubious category, its clear there is absolutely nothing noteworthy about it. From the Dispatch‘s publication of this quintessential non-story, I think we can safely assume that today was a slow news day in Columbus, Ohio. Tomorrow we’ll probably crack open our newspapers to look for breathless front page reports that the sun rises in the east and sets in the west. Every morning I walk past the Columbus Dispatch building on Third, and every night I see it again as I walk home from work. I like the news crawl, which gives me a taste of the latest developments in the world, but I especially like the neon sign that sits atop the building. It’s old school, with its delicate steel girder support structure and olde English script, and it’s been there, I think, since I first came to Columbus in 1971. Along with the Statehouse, the Ohio Theater and the LeVeque tower, it’s one of the few unchanged staples of the downtown area. Since at least 1700, April 1 has been the day to pull a prank and dupe the gullible. It’s a day to keep your skepticism level set at maximum, to make sure that strange memo you got at work isn’t a jest, and to double-check that what you’re stirring into your morning coffee is sugar and not salt. The arrival of April 1 made me think about jokes we used to play as kids. One of the most successful and most elaborate was a prank that my sister Cath and I pulled on UJ shortly after our family moved to Columbus in April 1971. At the time there was a pair of really cheap, almost plastic-looking black loafers lurking around the house. I don’t know where they came from — they weren’t Dad’s, and they certainly weren’t UJ’s or mine — but for some reason they became an object of ridicule and silly humor in our household. We called them the shiners, and they would mysteriously appear on your chair at dinner, or on your pillow when you went to your bedroom at night. It was one of those inside jokes that sometimes develop in families. After UJ deftly deposited the shiners with one of us, Cath and I decided to kick things up a notch. We came up with the idea of making UJ think he had won a prize in a contest. We decided that the Columbus Dispatch had sponsored a “best brother” contest and, with devilish cleverness, we thought that it would be more believable if we made out that UJ had taken second prize rather than winning outright. So we typed up an official-looking letter stating that, on the nomination of his brother and sisters, UJ had come in second in the Columbus Best Brother Contest, and that the enclosed gift was his award. Then we boxed everything up, wrapped it in brown paper, and mailed it all to make it look even more legitimate. One day, when we got home from school, Mom announced that UJ had received a mysterious package. With Cath and I barely able to control our glee, UJ first opened and read the letter — and fell for our scheme hook, line, and sinker. As he read the letter he seemed legitimately touched, saying something like: “Gosh you guys, you didn’t need to do that!” Then, with mounting excitement, he opened the inside box and found . . . the shiners. First a look of puzzlement, then a sense that a mistake must have been made, and finally the dawning realization that he was the victim of a practical joke washed over his face, and Cath and I had a good laugh. Mom, on the other hand, declared that enough was enough with the shiners, and they were never seen again. As is the case with many practical jokes, the planning and execution was fun, but the act of consciously fooling someone ultimately seemed mean-spirited. I’ve always felt kind of guilty about the shiners incident. Sorry about that, UJ! As I was walking home last night, I saw a blurb on the news crawl on the facade of the Columbus Dispatch building about Columbus police cracking down on downtown area jaywalkers. Oh, great, I thought: another questionable allocation of police resources to address a negligible problem when more pressing issues need attention. It reminded me of an incident that occurred many years ago, in which a lawyer hot-footed it into our firm to avoid being ticketed for jaywalking by a policeman. But when I read the Dispatch article on the effort, I saw that the effort is far more nuanced than the blurb indicated, and I actually support what the police are doing. The underlying problem is the recent time change, which means that Columbus is plunged into darkness in the middle of the evening rush hour. The statistics show that deaths from car-pedestrian collisions increase during the fall, so there is a real problem to be addressed. And, according to the Dispatch report, the enforcement effort is both even-handed — police are looking for jaywalkers and for drivers who make illegal turns or fail to yield to pedestrians who have the right of way — and is designed to focus on reminding people of their legal obligations, by having yellow-jacketed motorcycle cops stationed at key downtown intersections to talk to pedestrians and look for drivers who don’t yield, and representatives of city organizations handing out leaflets about the traffic laws near bus stops. I always cross at crosswalks, anyway, and while I like to make good time on my daily journey to and from work I’ll gladly restrain myself from crossing too early in exchange for police efforts to remind drivers about keeping an eye out for the pedestrians among us.